AMIAS FOOKE was born in Bishops Nympton in 1623, towards the end of the reign of the first Stuart king James I. No other references have been found in Bishops Nympton for Amias Fooke, so it is highly probable that he is the same man who occurs later in the Chittlehampton registers. These two large villages are less than 8 miles apart. The identification is strengthened by the fact that Amias Fooke of Chittlehampton named his eldest son Henry. Amias appears to be the oldest in a family of five. He was a newcomer to Chittlehampton. Fragmentary registers for the parish survive from the 1530s. They cover about two years. There are no Fooke christenings, weddings or burials during this period. Continuous registers start during the Commonwealth of the 1650s, following the Civil War. 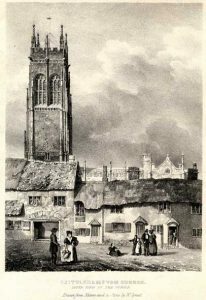 The Fookes were by then established in the village, but there was no large extended family. In 1654(5) Andrew ffook had his son ffrancis baptised and three years later we find the first record of children of Amias ffook. We know that Amias had a younger brother Andrew, also baptised in Bishops Nympton. The brothers may have moved to Chittlehampton together as teenagers. Perhaps they were apprenticed there. Amias is certainly there by the time of the Protestation Returns in 1641, Amias Fowke is the only man of that surname in the Chittlehampton Return. He would have been a young man of 18. His brother Andrew may have been with him, but he would have been too young to appear in the Protestation Return. Amias’s age makes it quite likely that he fought in the Civil War which began the following year. He may have been forced to join the Royalist army, but most of the common people of this area, including Bishops Nympton and Chittlehampton, were vehemently Parliamentarian. We believe Amias to have married in the early 1650s, around the age of 30. MARTHA. No record has been found for Amias’s marriage. The ink is so faded that the marriage register for Chittlehampton is almost illegible for the years preceding the baptism of their first child in 1654. Nor is Amias’s wife named at the baptism of their children. However, the burial register offers a clue. In 1692, nineteen years after Amias died, there is a burial of ‘Martha ffooke, widow.’ Since Andrew ffooke’s wife was Thamzin, and there do not appear to be other Fookes raising families in Chittlehampton at this time, there is a very good chance that Martha was Amias’s wife. If their son Henry born in 1654 was their first child, then the couple probably married in the early 1650s, soon after the execution of Charles I and the institution of the republican Commonwealth under Oliver Cromwell. This first Henry survived only 3 years. He was buried on 30 Jun 1657. Six months later, another boy was born. 1657(8) Henry s. of Amias ffooke borne 12 Jan. & bapt. 1 ffeb. 1660 was the year which saw the Restoration of the monarchy under Charles II. Five miles west of South Molton. The name means ‘the farm in the hollow’. The village is spread along a street and round a large square, which is said to represent the centre of a Saxon settlement. On the N side of the square is the church. Taddy’s Well, or St. Tiera’s Well, is at the E end of the village. For long marked by an ordinary village pump, after the medieval structure had been removed, this holy well was for centuries previously an object of pilgrimage; for here, sometime between the years 600 and 800, a young Celtic girl was butchered by Saxon peasants, who cut her to pieces with their scythes. Where she fell a spring gushed forth, and has flowed ever since; this was the first of many miracles of the saint. It is probable that she was buried in a chapel that stood on the site on which the church now stands, and here the pilgrims came to worship and to be cured of sin or disease. In its dedication to St. Hieritha the church perpetuates the name of the Celtic girl of thirteen hundred years ago. Her name, however, is probably more correctly spelt Urith. A similar story was told about St Sidwell, who was martyred outside the walls of Exeter, and who was also widely venerated in Devon. The story of the girl murdered by men with scythes may have an older origin in the Celtic corn goddess who was believed to be killed each year when the last stand of corn was cut. St Urith was born at a farm called Stowford today, in the parish of Swimbridge… She was buried in Chittlehampton church and her shrine was the scene of pilgrimage on her day (8th July) right down to the Reformation. She was a favourite saint in Devon. For centuries many families around Chittlehampton gave their daughters the name of Urith or Hieritha. W. G. Hoskins. Devon and Its People. The church, St Hieritha. The tower is 114ft high and was built early in the 16c. Pinnacle after pinnacle climb from the buttresses of the tower, and two dozen crocketed spires may be seen at once… The church comprises nave, two aisles and transepts, and chancel, and in addition a curious little extension to the N of the sanctuary that is known as the Shrine, and which is believed to be the shrine of the saint. It is no wider than a passage, and for a time was indeed used as a passage, to the vestry, but it has now been restored to its original purpose. On the floor lies a stone bearing the name and arms of Joan Cobley, d.1550, a re-use of a much more ancient monument, which it is likely covered the tomb of the saint. Here, therefore, they are commemorated together, the young Celtic saint and the comfortable wife of the local squire. The pulpit, of stone, has figures under canopies, and that on the N side shows St Urith holding the palm branch that signifies martyrdom and a book in which, no doubt, her miracles were recorded. The figures have become blurred in detail from having had the paint scraped off them – the pulpit was orginally coloured. The N transept is the Giffard chapel, and contains a monument to several of the Giffard family, erected in 1625, by Arthur Giffard. Arthur was a Royalist and suffered by it to the extent of a heavy fine. Séan Jennett (ed). The Travellers Guides: Devonshire. The cult of both St Urith and St Sidwell, was suppressed in the 16th century Reformation. There is evidence of virulent anti-Catholic feeling in these North Devon villages in the mid-17th century. The inhabitants of Chittlehampton were unlikely to mourn the loss of their saint. It took some years for the Church to restore what had been lost in the Puritan interregnum, when rich communion vessels, vestments, etc. had been banished. The churchwardens of nearby Filleigh regretted their present inability to provide all that was required. Wee prsent that wee have not att prsent the booke of Homilies and the Canons wch were allso taken from us. Unfortunately, the 1674 Hearth Tax return for Chittlehampton is badly damaged. A large number of names are missing. We have been unable to find what size of house the Fookes lived in. We do know that 35 of the 63 households in Bishops Nympton were described as “poor”. Henry ffooke, who may be Amias’s elder son, died in 1678. Amias himself died the following year. His will was proved in 1680. His name appears in the transcription as Amos. Thirteen years later there is another burial which may be that of his wife. 1692 Martha ffooke, wid. burd 26 Augt. BMDs from parish registers and DCRS transcripts.